When during Geneva Motor show, Sergio Marchionne and Mike Manley, Jeep brand’s chief, revised the sales target for 2014, they were right. Initially Jeep was supposed to sell around 800.000 vehicles this year, up 10%, but the success of the Cherokee in USA and the good momentum of the brand in many other markets, forced them to rise the target up to 1 million units. It means that Jeep will have to find 270.000 more clients this year in the whole world. Certainly, based on the current range, the brand positioning, and recent results, the brand is heading to this goal without any problem. In the first half of 2014 Jeep delivered more than 480.000 units worldwide and posted a month-record of 100.000 units sold in May (70k in USA). Based on the data gathered for 35 countries (only China is estimated), the results are strongly positive for the SUV brand. These 35 markets totaled 465.000 units but they don’t include the sales registered in the Middle East countries, Egypt, Magreb, South Korea, ASEAN, Chile, Peru, and Panama. USA leads with almost 70% of total sales thanks to the Cherokee boom allowing the brand to increase its registrations by 45%. The jump is mostly explained by the fact that US car market recovery is quite related to more SUV/CUV purchases, just where Jeep is. 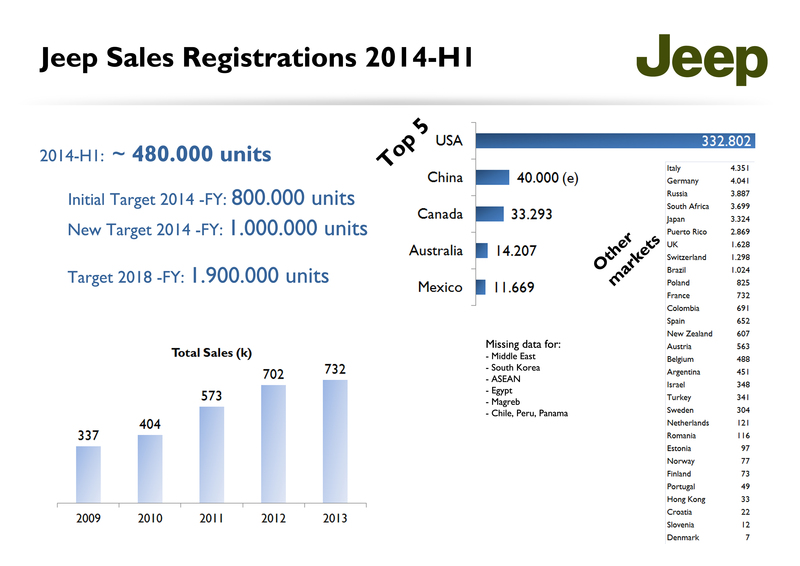 Taking into account the new target for 2014, Jeep isn’t far from it. USA, China and Canada outperform, while Australia and some other minor markets had brilliant results. Sales should be around 480.000 units including other markets such as the Middle East, where Jeep is quite strong. But USA isn’t the only market where Jeep expands. China numbers may be around 40.000 units so far this year, accounting 8% of total deliveries. FCA estimates to sell 90.000 Jeeps in China this year, up from 60.000 in 2013, and 46.000 in 2012. All of these numbers correspond to imported vehicles because the local production is due to start in early 2015. Jeep offers the whole range in China and is already promoting the Renegade. Canada comes third with more than 33.000 units, up 41%. The Cherokee is also succeeding over there, with 10.300 units, the second best-seller of the brand, right after the Wrangler. Australia is the other great performer: sales rose 43% to 14.200 units surpassing Mexico as the fourth largest market for the brand. The Grand Cherokee broke into the top 10 best-selling cars models in May. Mexico closes the top 5 being the solely market to reduce registrations due to a very bad June, down 46%. 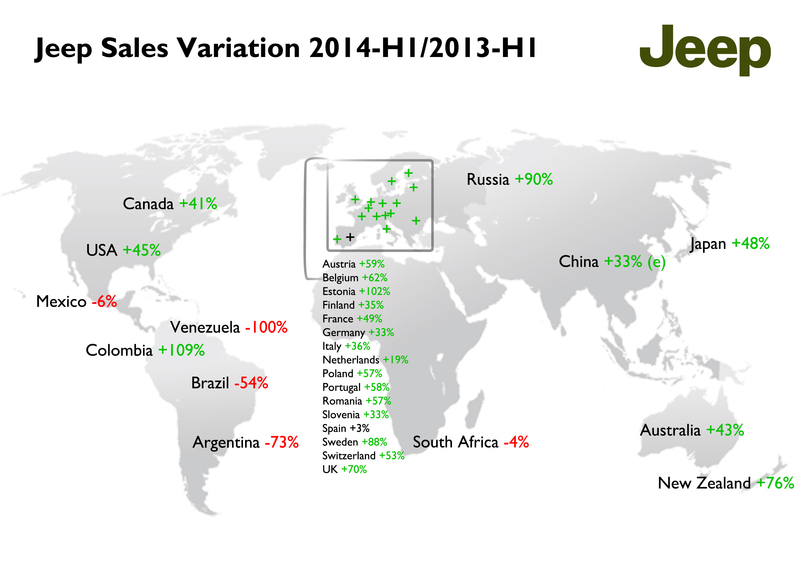 Jeep great results during the first half of this year are mostly coming from USA, Canada, China and Australia. Europe did very well but it is still small. Middle East should help EMEA region to reach 80.000 units by the end of this year. Europe + Russia + Turkey totaled a bit more than 20.000 units, which is a very small result. Latin America, with the exception of Colombia, had very bad results due to political/currency problems in Venezuela, and tax new regulations in Brazil and Argentina. Right after the usual top 5, comes Europe. 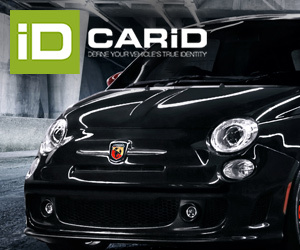 Italy is ahead with 4.350 units, up 36%, and is closely followed by Germany with a bit more than 4 thousand units, up 33%. But Russia is the best performer rising its registrations by 90% to 3.900 cars. The brand continues to grow in a slowly but secure way considering that Russian car market is down 8% in 2014-H1 and 6% in 2013. Other big jumps come from Japan, the UK, Switzerland, Colombia, New Zealand and Sweden. In the other hand there are Brazil and Argentina, where government regulations and more taxes have increased the price of imported and luxury cars (in the case of Argentina). And that’s particularly shocking right now when Jeep points at Latin America as one of the regions where its sales will grow dramatically in the next 4 years. The idea is to start local production of the Renegade in Pernambuco plant in 2015 so it can avoid import taxes in Mercosur markets. Jeep wants to sell 1 million units this year. It is not certainly far from that goal and the good thing is that it will be the starting point for a massive growth up to 1,9 million units in 2018, when China, Brazil and India will add their manufactured Jeeps to global sales. Good for Jeep, good for FCA. It took me a while but now I’m back. Thanks for reading! Hola Ariel! que bueno recibir mensajes de colombianos. En realidad es muy poquita la gente que me lee desde allá. Que es ‘Allpar’? que opinas de los articulos? como debo mejorarlos? te gustan los autos? el grupo Fiat?